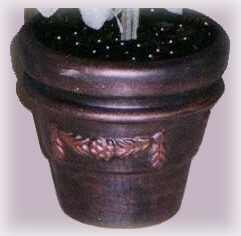 This clay pot project features the same easy painting technique used on our Faux Aged Brass Clay Pot. The rich patina on these pots will complement any decorating style, whether you use them as planters, topiaries, or as a stand-alone accent. Patio paint, or a similar brand product, is recommended, although not strictly necessary. First, paint the clay pot entirely in black and allow the paint to dry completely. Mix one part water and one part Metallic Copper paint, blending them together well. Dip a damp sea in the combined paint mixture, then wipe the entire pot, applying as much of the thinned metallic paint as needed to achieve the desired finish. Allow the paint to dry. Pick up a small amount of Metallic Copper paint (not diluted with water) on a dry paint brush. Dab the excess paint onto a paper towel and gently brush small amounts of paint onto the embossed (or raised) areas of your pot and around the rims and edges. Remember that, sometimes, less is more, so apply very small amounts of paint until you have the desired affect. Be sure to allow each layer of paint to dry, before adding the next.